The airport is closed during the aerobatic performances and daily from 7:30 PM to 6:00 AM from April 2 – 7. Pilots are responsible for checking NOTAMS for air traffic information and arrival/departure procedures. Tune to ATIS frequency 118.025 upon arrival for update. Click below for printable Aircraft Parking Signs. Your sign should have a light color background with dark six inch letters that can be seen 50 feet away. NOTE: Please DO NOT USE AN ELECTRONIC TABLET FOR YOUR SIGN! The screens are polarized and will go black when viewed through most cockpit canopies. Only aircraft built from 1970 or earlier are permitted to park or camp in the Vintage Aircraft Parking. We appreciate the event support we receive from our surrounding airport communities. Many of these airports provide SUN ‘n FUN ticket sales, rental car services and shuttles to and from SUN ‘n FUN. Click Here for a printable PDF file containing the Local Area Airport Directory. 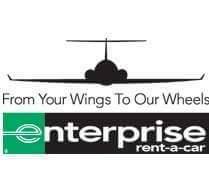 Enterprise Car Rental’s onsite office will be located on the southside of Doolittle Road, just south of the Onsite Tram Depot and SUN ‘n FUN Drive. SUN ‘n FUN is happy to offer our Pilot Welcome Center, brought to you by Phillips 66, located across the taxiway Foxtrot from Vintage Hospitality building. This facility will provide free wireless internet (the password will change daily, so be sure to check the desk for the new one! ), flight planning facilities, and other flight related services. Be sure to visit and take advantage of this new service while learning about the products and services Phillips 66 has to offer. Hours: 8am – 6:30 PM daily. Flight planning and self-serve weather services available all day. Please use the forum below to request a passenger or seat for a flight coming to or leaving from SUN ‘n FUN. This flight forum is provided to our guests strictly as a resource to locate passengers or available flights/seats who’s destination is SUN ‘n FUN Fly-In. SUN ‘n FUN does not endorse or recommend any pilot or aircraft and any agreement completed, written or verbal, is between the aircraft owner, pilot and/or passenger only. This listing is provided as “Information Only”! Posts will be reviewed for approval before they are posted to this site. Your post will not appear immediately. Thank you! CLICK HERE for our Flight Announcement Forum. CLICK HERE for our Flight Request Forum. As Sun ‘n Fun’s compliance partner, A-C-T Environmental & Infrastructure’s trained personnel are on site and ready to mobilize should there be a fuel or other contaminant release. In this official role, A-C-T will work, cooperatively, with aircraft owners, local first responder agencies, SUN ‘n FUN and the various regulatory agencies to ensure safety and compliance with all environmental and health regulations. 7. If a spill occurs, REPORT IT IMMEDIATELY to a SUN ‘n FUN volunteer. This is critically important because trained environmental emergency responders can minimize negative impacts with early intervention! Remember, A-C-T stands ready to be your compliance partner. You can reach us 24/7 by calling 800.226.0911. To learn more about A-C-T’s expertise and capabilities, see www.A-C-T.com . We’re here to help make your SUN ‘n FUN experience enjoyable from beginning to end. Happy take-offs and landings!